Big Dog Calluses: Are They Inevitable Or Preventable? I posed a question to fellow Mastiff owners on a Facebook group board several weeks ago. Here is my question, paraphrased for brevity. The responses I got back were mixed but contained an underlying theme. Some said don’t bother, they are inevitable in big dogs and cannot be prevented. Others suggested that calluses are “no big deal” and can actually be beneficial for the dog. A few people recommended products such as Bag Balm, Dog Leggs, coconut or vitamin E oil, and soft bedding, but the overall consensus was that fighting dog elbow calluses would be a losing battle. Well, if there is one way to fire Big Dog Mom up, it is to tell her to give up before even entering the ring! This post is PART ONE of my journey to prove them wrong. Just like humans, calluses are caused by skin coming into contact with something rough (carpet) or hard (tile or concrete) repeatedly. Over time, rough skin forms and, if left untreated, becomes a callus. Dog elbow calluses are often referred to as dog pressure sores. The most obvious sign of a callus is the loss of hair and formation of dark, wrinkled, and thickened skin around the bony points of the elbow and hock. 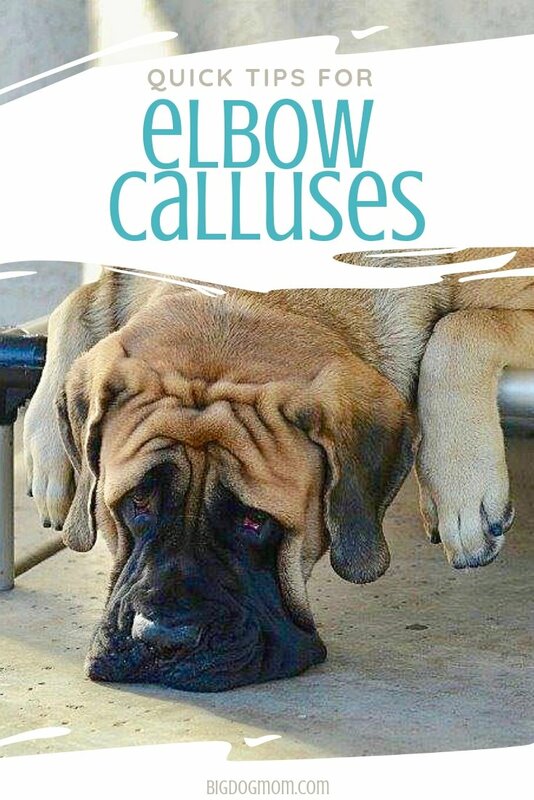 Elbow calluses are most common in large and giant breed dogs, like Mastiffs. The consensus of most big dog folks is that calluses on the elbow are primarily a cosmetic concern and do not pose a health risk unless they are left to a point where they crack and bleed. Bleeding elbow calluses easily become infected and should absolutely be treated by a veterinarian as soon as possible. A small percent of elbow calluses can become inflamed to the point of infection with resultant ulceration and draining fistulas. When this happens, it presents a very real problem which is extremely tough to deal with, often requiring long-term topical and systemic medication followed by surgery. Note: Often lumped in with elbow calluses are hygromas. Dog elbow hygromas are a subcutaneous, fluid filled swelling at the pressure point of a bone (usually on the elbow). Similar to elbow calluses, they are caused by repeated trauma at the joint by lying on hard surfaces. They are the body’s way of protecting the joint and, as such, SHOULD NOT BE DRAINED in most cases. In my experience, elbow hygromas, while sometimes unsightly, go away in time. Sulley had two relatively large elbow hygromas on each of his elbows when he was about 20 months old. They appeared and were gone in the matter of three months. For more information on elbow hygromas, read here. **This review is NOT sponsored or endorsed in any way by Blissful Dog. This is simply an honest review of my experience so far in using Elbow Butter on my dogs. Disclosure: This post contains affiliate links to products I use and recommend. Determined to find an elbow callus treatment for my dogs, I bought a container of Bag Balm from a local feed store. I began to apply it 2-3 times a day for about 4 days before my son and daughter revolted from the smell. As soon as I would open the container, they would run out of the room pretend gagging. Apologies to the Bag Balm people. My kids can be dramatic. Nonetheless, I did agree to find a better smelling alternative. A simple Google search revealed Blissful Dog Elbow Butter which is an all-natural product made in Minnesota. I bought the Blissful Dog Elbow Butter 8 oz Tin on Amazon and started to apply it 3 times a day every day to both Junior’s and Sulley’s elbows and hocks. I have been applying the Elbow Butter for four weeks, 2 -3 times a day and here is what I found. **Update: I continued to use the Blissful Dog Elbow Butter with marginal results for another couple months. While the smell was a significant improvement over all the other products I tried, long-term use didn’t affect the overall size or quality of my dog’s elbow calluses. I do still recommend this product, however, I have developed my own dog elbow callus home remedy which I believe works even better and might be more cost-effective for big dog owners. For my DIY homemade elbow butter for dogs, click here and read How to Treat Dog Calluses Naturally with DIY Elbow Butter and Essential Oils. 1. Provide supremely supportive surfaces for your dog to lay on. I have two Big Barker Premium Dog Beds which I believe are worth their weight in gold. While Junior and Sulley prefer to sprawl out on the tile floor during the day when it is hot, at night and in the cooler months, they love to snuggle on their Big Barker! And to keep them up off the concrete outside, I have a Kuranda Dog Bed which I LOVE. It is lightweight, super easy to clean and chew proof. I have had ours sitting outside in the AZ heat for several years and it still looks brand new. And, while support is key, it is not everything when it comes to dog elbow calluses. Keep in mind that FRICTION can also be a huge contributor in the development of calluses due to the constant rubbing against the skin. Naturally I learned that little tidbit from Dawg Business: A Note On Elbow Calluses 3 weeks into my trial. For the last three weeks I had been gating the dogs in our carpeted bedroom so that Sulley and Junior would sleep on the carpet rather than having the option to lay on the tile. Most nights the boys do sleep next to our bed on the carpet or on their Big Barker, but for this trial I was trying to control the amount of time they spent on the tile. What is the motto? When you know better, you do better? In an attempt to reduce the amount of friction on my dogs’ elbows and hocks, I have started to lay out two soft Queen size comforters next to my bed to cover up as much of the carpet as possible. I lay them down with the Big Barker in between in hopes that if they don’t lay on the bed they will at least lay on a surface with less friction on their skin. I am interested to see if this makes any difference in the size and growth of the dog’s elbow calluses when I combine it with the dog elbow butter and the next few products. 2. Try a Cooling Mat during the warm summer months. I have not actually used a cooling mat, but I have heard great things from others about them. Check out this review from My Brown Newfies about her experience using a cooling mat with her two Newfoundlands. Don’t tell Sulley and Junior, but I am considering one of these for their Christmas present this year. *Update: I do now have a Cooling Mat and I absolutely love it! A full review will be coming soon! 3. Use Dog Leggs when you know your dog will be on hard or rough surfaces. I don’t have a pair of these, but like the Cooling Mat , I have heard good things about them. They are particularly helpful for the prevention and treatment of dog elbow hygromas. 4. Try vitamin E oil or Petroleum Jelly (Vaseline) or Bag Balm as alternative topicals that may also help the healing process. All of these products will serve to soften the callus and may aide in the healing process. Similar to the dog elbow butter, you will want to really massage all of these topicals into the elbow callus for optimal effectiveness. 5. Consider the benefits of improved nutrition. I have heard two different perspectives with respect to diet affecting the development of dog elbow calluses. One that said diet is everything, the other that said diet made no difference. Here’s what I say. As I stated in my post What To Do About Dog Food? First, Let Go Of The Guilt!, I am on a nutritional journey of sorts with Junior and Sulley, slowly transitioning them to a raw diet. Do I think that will magically make their elbow calluses disappear? Not in the least. But what I do believe is that a more species appropriate diet is better for their health overall. Because of that, I can’t help but think a better diet might help the healing process from the inside out. Are Dog Elbow Calluses Inevitable Or Preventable? Over the last 4 weeks the texture of Junior’s and Sulley’s calluses has improved some and I have noticed some re-growth of hair on Sulley’s elbows. However, based on my tracking of the size of my dog’s elbow calluses, there has not been a remarkable change in the overall size since starting on this journey. Was it that the Elbow Butter just wasn’t enough on its own or that I forced my dogs to sleep on carpet for 3 weeks before realizing that might not be best for them? Would my results be any different if I used a combination of topicals, had the availability of a Cooling Mat given the AZ heat, did a better job of reducing friction on my boys’ elbows, or fed an entirely raw diet? What if I had started lubricating these areas when Junior and Sulley were much younger, before they ever formed a callus on their elbow or hock? And, everyone’s favorite topic, what role do genetics play in an individual dog’s predisposition for elbow calluses? These, of course, are rhetorical questions. I don’t know the answers and my guess is you don’t either. So here’s my perspective. Elbow and hock calluses in big dogs don’t HAVE to be inevitable. I may not be able to completely heal what is already there, but I can certainly try to prevent them from worsening or causing issues in the future. I am not willing to give up the fight just yet. Continuing my battle against this coarse and resolute foe, is the second post in this series, How to Treat Dog Calluses Naturally with DIY Elbow Butter and Essential Oils. Have you struggled with dog elbow calluses? What steps have you taken to treat or prevent them? I would love to hear your experience in the comments below. Because elbow calluses are such a widespread problem in big dogs, please consider sharing this with your friends using the buttons below. So interesting! I not only have two large breed dogs but also have a custom blend of salve I make and sell that I use on my dogs. I love hearing of other blends that use natural products and herbs or oils. We’ve been thinking about getting Big Barker beds for them as well, esp as Gonzo has been showing early signs of arthritis lately. Thank you so much, Heather! Your salve sounds super interesting! I look forward to learning more about it and feel encouraged that you’ve had good success using it. Definitely get a Big Barker! My boys are lucky to have two of them and I wouldn’t personally buy any other bed! Max had really bad calluses when we adopted him. I honestly didn’t think much of them, figuring he’d just been outside a lot. In the year that he’s been with us he lays, almost strictly, on the couch and bed, or in the grass. The calluses that I thought would be permanent, are actually healing, and even starting to grow fur again. That is so wonderful to hear, Heather! It is proof that calluses, as I have said, are not inevitable and can be treated. They may never go away completely, but they don’t have to get to the point that some owners allow them to get. Thank you, Ruth! I have not heard of that product before. I will look into it. I wonder if it would be strong enough to work for big dog calluses as well. I love this!! I’ve never read a post about dog calluses, but most all of us have to deal with them. Nutrition is so important with everything! I believe it. I agree, Shelby! Thank you! I didn’t even know this was a problem. Fortunately, my terrier doesn’t get these issues, but has his own share of problems. I looks like dog beds might be the best preventative measure. I just finished babysitting a big dog for a week and didn’t think to check her for these. Thank you for your comment, Sherri. Yes, I agree about having ample alternatives to hard flooring like tile, concrete and carpet for dogs to lay on. The challenge for me is getting my dogs to use as much as they should. I had no idea that calluses could be such a problem on larger dogs. I would suspect they are also a problem for dogs who spend a lot of time on concrete or hard surfaces regardless of their size. I’ll bookmark this post in case I need it! Thank you, Lori. 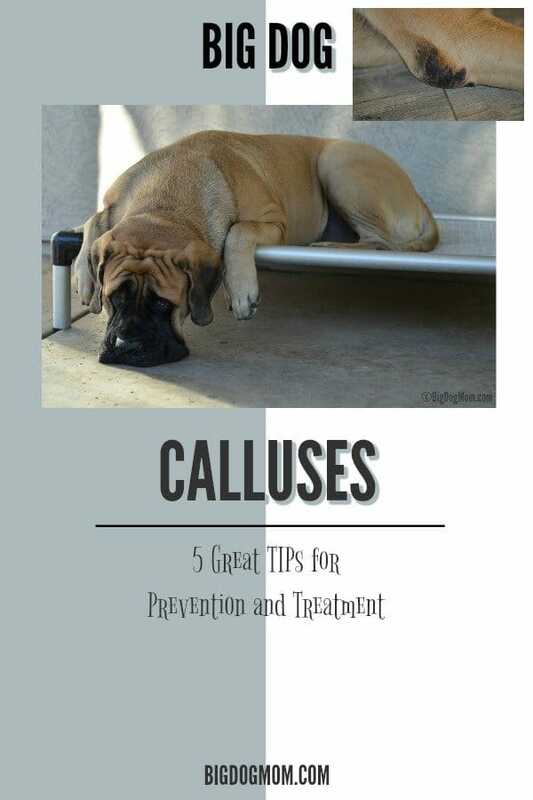 Yes, calluses are definitely more common in large and giant breed dogs due to the increased weight that is placed on the joints. Depending on genetics and time spent on hard surfaces, I would think smaller dogs could most certainly get them too. I’ve always been a cat mom however I think this elbow butter works pretty well. Great review. It’s too bad the containers aren’t bigger to include more product. You do have big dogs after all. At least the product worked though. I agree! Thank you, Kamira! I have two friends with big dogs and I’m going to share this info with them. The elbow butter sounds like a great product and I’m looking forward to reading your sequel. Mr. N is a very smart little guy! Thank you, Tonya. I’m so happy your dog didn’t get them. I can see how useful this stuff can be for big dog parent. I had no idea this happened! I enjoy your videos (the video sound was a bit quiet on our computer but that could be us). Thank you! I’m hopeful the sound is ok for most people. I haven’t gotten any other complaints. I will check it out though. Thank you for the heads up. Our Bullmastiff had calluses, but they didn’t seem to cause her any discomfort. However, I think she would have enjoyed the spa treatment. Thank you, Beth. My boys do love the pampering and they often start to snore when I’m applying the Elbow Butter. Fortunately, the calluses don’t bother them at all either. I’m just trying to prevent any possible issues in the future by getting on top of them now. This post is a surprise coincidence since I just saw a big lab mix at the place we were glamping and she had calluses too! you are so right in saying that they should be prevented to begin with or taken care of at the very least before they become worse. 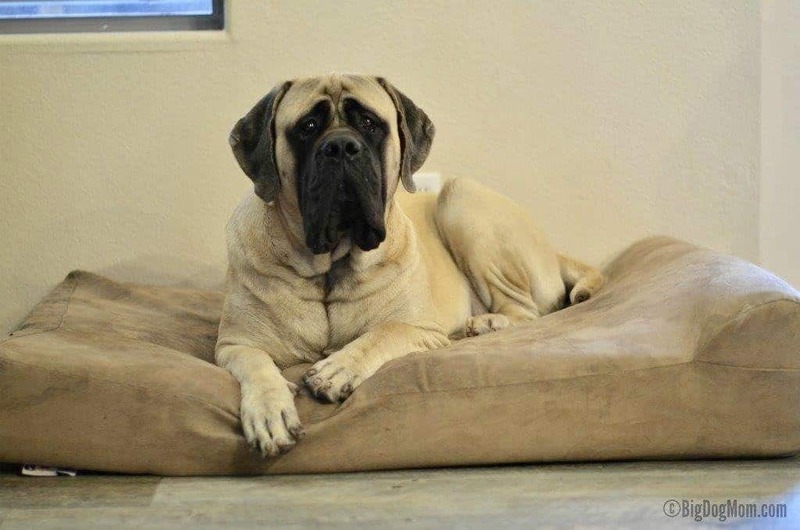 Your mastiffs are adorable by the way! Thank you so much, Paroma! I had no idea big dogs could get calluses on their elbows. Thank you for an informative post. I am feeling guilty I did not do more for our big lab Cookie’s elbow calluses but they did not get too big, bad or cracked etc. My little rescue rascal Kilo the Pug is always on a knee, a couch or a bed unless cooling off on wood floor. He has not had any yet. I am happy that Cookie’s calluses didn’t get too bad. My guess is Kilo won’t get them given his size. I could be wrong, but most little guys are pretty safe. Ruby doesn’t have calluses, but this was still super interesting. Our former dog was tiny, but still had some calluses later in life. He also had a cooling mat (because he had heart disease). I never even considered this might also help his calluses! Thank you! Yes, I am definitely going to try a cooling mat in the coming months. I am pretty confident my dogs would use it. Now that I think about it… I will probably have to buy two. My boys are too big to fit on one. Ouch! The result, if left untreated sounds most uncomfortable: infection, inflammation, ulceration and draining fistulas! I commend you for wanting to try prevention rather than cure. Hopefully you shared your post in the discussion group. Although we have weenie ones, I look forward to learning how you progress. Wonderful post! There are so many options to help with calluses. I know my humans help me with having cooling mats for outside, raised beds for outside, and fluffy beds. I didn’t realize that calluses were such a problem for dogs. It makes a lot of sense though – dogs are very physically active. Cats aren’t as prone to calluses, so I haven’t encountered that situation with my kitties. It looks like that butter does a great job in helping those calluses go away! I am glad you are thinking of all of the possibilities to lessen and possibly eliminate these calluses…would love to know what you find that works the best. FREE all natural treatment for dog calluses! Grab your complete recipe and step-by-step directions to make your DIY Elbow Butter with Essential Oils. You're almost there! Fill in the form below and get instant access!